The month of October has been designated by Christians worldwide as Clergy Appreciation Month. In the same way that other professions are honored during the year, a date was officially chosen to honor pastors and those who perform ministerial work. The General Conference of Seventh-day Adventists has set the second Saturday of the month— October 13 this year—for this well-deserved tribute to our pastors. The nature of what pastors and their families accomplish is unique. God entrusted to them one of the most precious responsibilities: to care for His church. When they fail to fulfill this duty, church members are harmed. In this context, the pastoral family has a great responsibility before God and the church they serve. The church, on the other hand, needs to pray for them and support them in their work. On Pastor’s Appreciation Day, church members from more than 150,000 congregations in 215 countries around the world have the opportunity to express gratitude to God and recognition to their pastors. On this Sabbath, you don’t need to prepare a special sermon in honor of the pastoral family, for the hour of worship must always be reserved for the nourishment of church members and to glorify God. Messages based on the Bible and focused in Christ should be presented in each service. Any recognition should be done before and/or after the message. Make plans to celebrate Pastor’s Appreciation Day in your church/conference/union/division. Say a public word of appreciation for the pastoral ministry. Dedicate a special prayer to pastors and their families. Present a song that the pastoral family appreciates most. Write a letter or prepare a special card signed by church members/officers. Offer a gift in the name of the church. Invite the pastoral family to a meal. Call, text, email, or send messages through social media to your pastor on that day. Plan a special fellowship reception hosted by the church/conference/union/division. 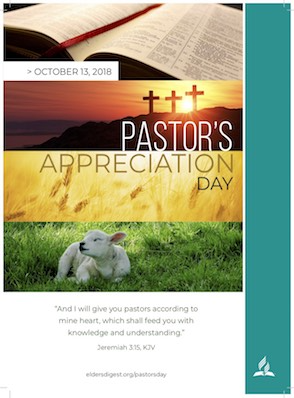 Download, advertise, and place the suggested poster on “Pastor’s Appreciation Day” in your church or organization to create awareness. What matters most on Pastor’s Appreciation Day is the gratitude and recognition from the local congregation and other church entities. Pastors are spiritual leaders—make this day special for them! Additional resources are available from Ministry Magazine and NAD Ministerial. Note: The poster for download is available at eldersdigest.org/pastorsday. You will also find an open document for translation purposes, and considering that in some places the date for this celebration may be different.